October 2018 eBuzz: OrcaLab now runs on solar...because of you! 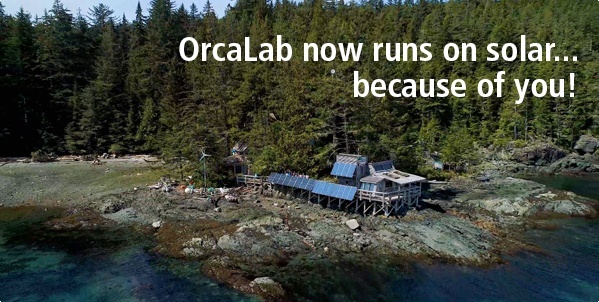 OrcaLab is a not-for-profit research station in B.C. that recently made history by becoming the first orca research facility in Canada to be solar powered. The project is one example of how Bullfrog customers are empowering communities across Canada to protect our environment and its species—and helping transform our energy landscape. Read more about this inspiring story in the StarMetro Vancouver. Bullfrog Power recently held screening events for customers in Toronto to watch Anthropocene, a visceral film that documents our profound impact upon the planet. Each screening was followed by a customer Q&A with directors (and Bullfrog customers) Edward Burtynsky, Jennifer Baichwal and Nicholas de Pencier. Anthropocene is accompanied by bullfrogpowered exhibitions at the Art Gallery of Ontario and National Gallery of Canada, which continue through 2019. The production of the film was offset by Bullfrog's sister company, Less Emissions. Visit Anthropocene online and support the efforts of fellow Bullfrog customers! From October 12 to 14, The Bentway hosted the Canadian premiere of Daan Roosegaarde’s WATERLICHT. The breathtaking event—which was bullfrogpowered—combined LEDs, special lenses and fog machines to create a massive light display simulating a virtual flood along a 1,000-foot stretch of Lake Ontario’s original shoreline. Bullfrog invited a group of customers to a private tour of WATERLICHT. Amongst the waves of light and sound, the abstract threat of climate change felt all too real to attendees. We're proud of our community for being part of the solution. Award-winning rock duo Dear Rouge is bullfrogpowering its 2018 Canadian tour with 100% renewable electricity! The band sprung to the forefront of the Canadian indie rock scene after winning the 2015 SOCAN Songwriting Prize for "I Heard I Had" and becoming Breakthrough Group of the Year at the 2016 JUNO Awards. Check out the band's YouTube channel as well as its upcoming tour dates. Bullfrog recognizes Clean50 Award winners! The annual Clean50 and Clean16 Awards recognize executives and emerging leaders who have made outstanding contributions to sustainable business. This year’s Clean50, Clean16 and Emerging Leader Award recipients include those from the bullfrogpowered community, such as RBC and Beau's All Natural Brewing Co.—and also includes Bullfrog Power’s own CEO, Ron Seftel. Congratulations to all recipients! Looking for a healthier snacking option? To coincide with Non-GMO Month this October, bullfrogpowered Left Coast Naturals is introducing two new snacks made with natural, whole ingredients: Cauliflower Crisps and Avocado Crisps. Learn more! Left Coast Naturals, which bullfrogpowers all its facilities, was amongst the first organizations in British Columbia to choose green energy with Bullfrog. As part of their investment in the long-term health of their communities, more and more credit unions across the country are demonstrating leadership in sustainability by choosing green energy with Bullfrog Power. Check out our guest blog post by Provincial Credit Union CEO Bernard Gillis to learn more about the growing group of bullfrogpowered credit unions across Canada.